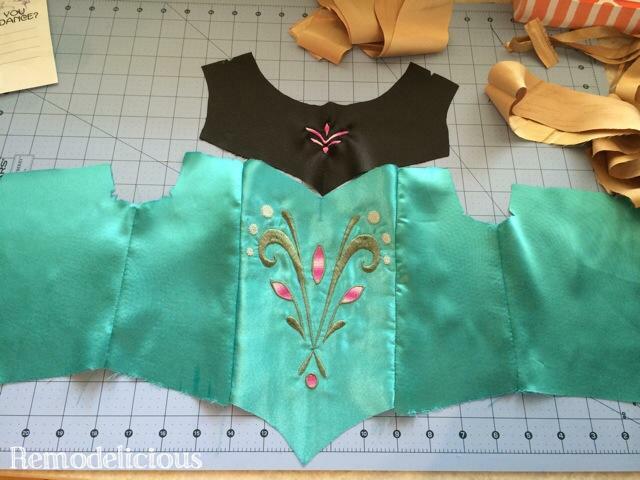 UPDATE: If you’ve made a Frozen costume, we’d love to see it! You can add your photo in the comments. things since, as a pair of platinum blonde & strawberry blonde sisters, they have made an extra-special connection with the movie. Chloe asks me often if I’ve figured out how to give her powers yet and has attempted to freeze her sister on a few occasions of extreme frustration. Cora points to Anna and says “that’s me!”. I absolutely melt when they dress up like Elsa & Anna together. It’s also no secret that Frozen merchandise, and quality costumes in particular, are in such high demand that parents are practically selling their kidneys for one. We won’t be doing that, but I can put some time and effort into it for my princesses. 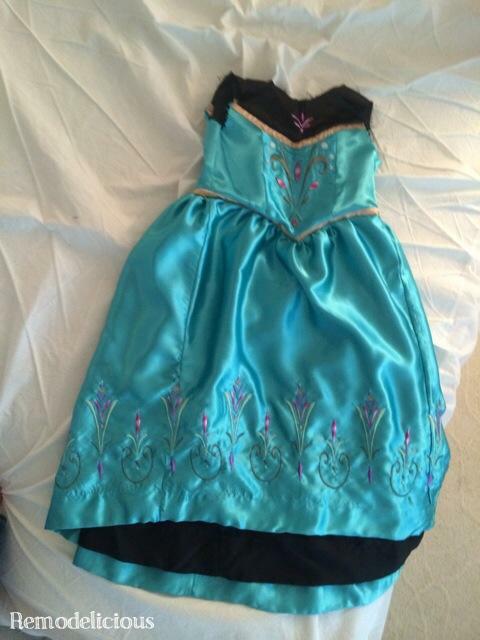 Most kids are after the Elsa ice dress. Let’s face it, if it were appropriate for me to wear it, I’d want to dress up in that high-glam, sparkling blue gown as well. Chloe does love that dress (and we lucked into one at the Disney Store during an unplanned shopping trip), but what she really wanted (of course) was Elsa’s coronation gown. I’ve heard rumors that the Disney Store had these for about two weeks before recalling them, but I’m not sure if that’s true because I’ve never seen a picture of them and Disney Store “cast members” are trained to dodge questions about products that aren’t available. I’m not one to take “no” for an answer and found myself on a serious mission. I knew I could make it if I was patient and planned it out well enough. I also knew that I could make a higher quality dress than typically available for a reasonable price (Disney Store dresses are typically about $50-70). 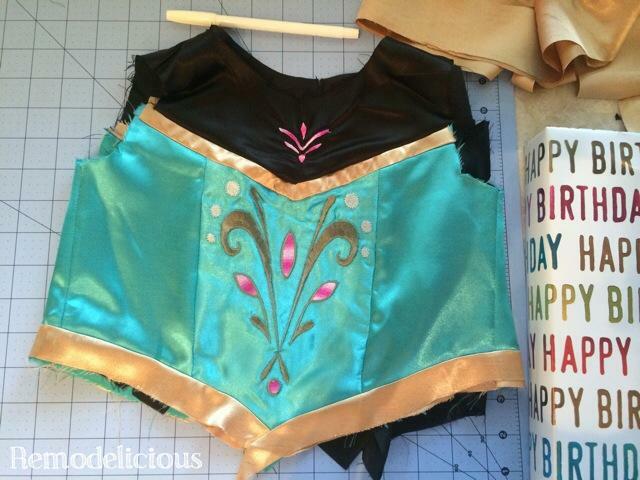 I happened upon this tutorial for making the Elsa ice gown. It has the same basic lines as the coronation gown, so I used the tutorial as my guide. I used the simplicity 2463 pattern as my guide and added a deeper “V” to the bottom of the bodice and added one to the top. I made a pattern for the sleeves by tracing a long-sleeved shirt in the same size as the pattern and traced the dress pattern shoulder where the sleeve attaches so it would match up. I opted not to bother with the collar on the dress and fortunately, my little type-A princess hasn’t noticed. I picked out high quality satins and lining in the closest colors I could find. 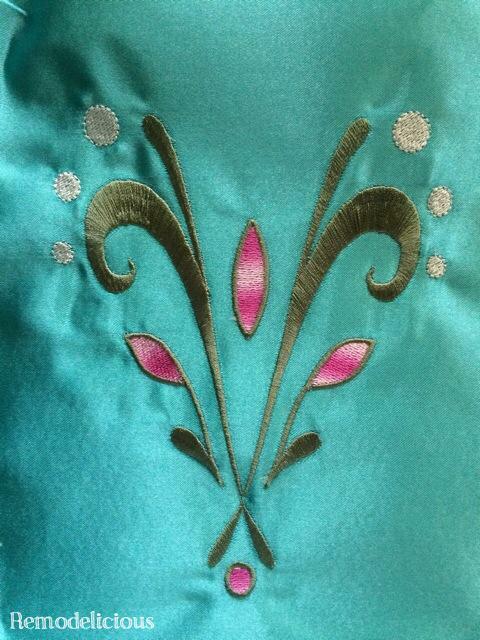 First, I embroidered the bodice design onto fabric. I did this prior to cutting the pattern out to make hooping a breeze (which should lead to a better embroidery result) and so it would be easy to position the design. 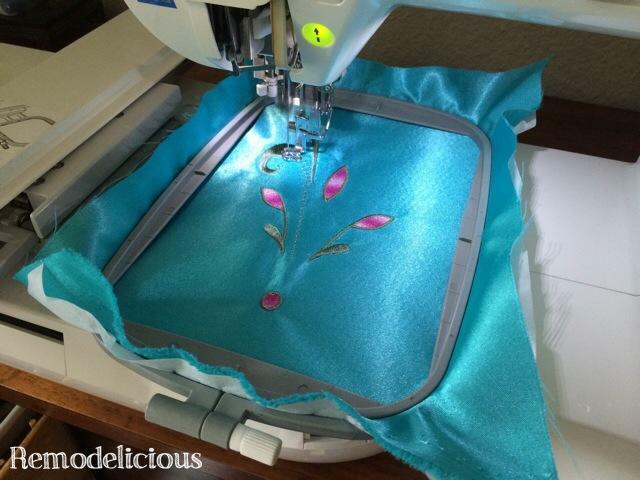 I found a great resource for Frozen embroidery designs from Lovey Leaf Appliqué on Etsy. 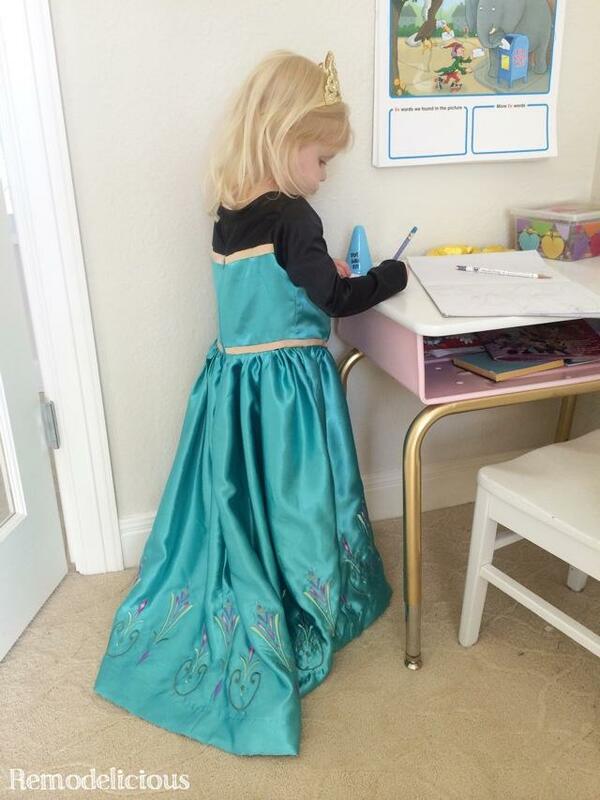 She had designs for the Anna dress ready to go and quickly whipped up the Elsa design once I requested it. Some sellers charge an arm and a leg for these designs, but this shop is very reasonable (and honestly, I think her designs are more accurate). Next, I stitched all of the blue bodice pieces together. This is literally the second dress I have ever made and the first was over a decade ago. Seeing this part come together really gave me the confidence that I could actually pull this off. Then came the hard part. I embroidered and cut out the front black piece for the front of the dress. Rather than bother with getting the exact pattern, I used a piece of the Anna skirt design. I was worried that my typa-A princess would notice, but thankfully she didn’t! The golden trim is not part of the pattern and I had to figure out how to attach it. Step 1-20 of this was standing there staring at the pieces, occasionally cutting and pressing a piece to try. Eventually, with some help from my mother-in-law, I finally figured out a plan. I started on the back pieces since they are straight (i.e. easier). I cut trim pieces 1-3/4″ wide, pressed them in the middle with wrong sides touching.I lined the raw edge of the trim up with the raw edge of the blue back piece, opened the gold piece up, and stitched them together at the fold of the gold piece… then I folded the gold trim back to reveal the right side and sewed the blue, gold, and black pieces together. I did the same on the front, only I first traced the edges of the front of the blue part of the bodice onto the gold fabric and then added 1-3/4″ and traced it again so that the gold trim would have the same shape as the bodice V’s. Don’t mind my projects merging in this photo, it was a busy weekend! On the bottom of the bodice, I did need to fold the trim over in the middle using this method. It isn’t noticed on the completed dress. It is all one piece, but could be cut as 2 pieces. Next I connected the skirt pieces & hemmed the skirt with a blind hem. 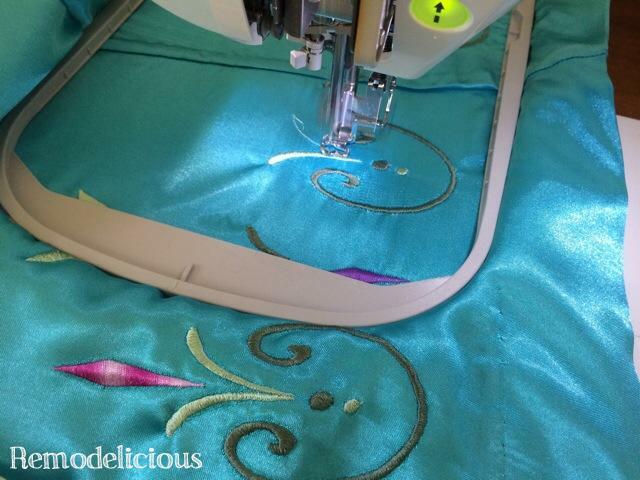 Before sewing the skirt on, I spent the better part of a weekend embroidering the skirt. I added a bit of a train to the skirt to give the dress some movement, but this is technically incorrect to the movie so feel free to make your skirt straight. The skirt design is another from Lovey Leaf Appliqué on Etsy. It is two separate designs. I used my XL hoop, put one design in the middle and outer edges, then centered the other design between them. You can use a smaller hoop, but will have to move it more often. My machine has an edit feature that allowed me to do this, not all machines have this. If you don’t have this feature, you will have to hoop a lot more often. Note: I used fusible stabilizer. I did this all above the hem because I left extra material that can be let out later. To connect the designs together, I created another version of the design with 3 of the shorter designs separated by 2 of the taller ones (so basically the opposite of the first one). I had to guestimate a little when I moved the hoop, but I did mark on the skirt where the first hoop had been placed so I would know roughly what the margin is. It ended up working out beautifully and looks very consistent. A rainy weekend made for the perfect opportunity to do the embroidery on the skit… while my kids watched Frozen on repeat behind me! Once that was finally finished (and the design happened to line up exact for me so I didn’t need to do any extra spacing in the back), I finally attached the skirt. THAT is a big moment. I thought that the girls were going to run off with the dress when I did a little fitting, but Chloe pointed out that it wasn’t like Elsa’s dress yet because it didn’t have long, black sleeves. So, on went the sleeves, neck trim, zipper, button, and all of the finishing touches were complete. This was a seriously exciting moment for the entire house. I she hardly took the dress off for a good week (even slept in it a time or two) even though I had yet to finish the cloak. Note: I went with black lining because I couldn’t find a matching blue at the time. She paired it with what is officially Anna’s Disney Store tiara, but as even 2 & 3 year olds can point out, Anna doesn’t wear a tiara and Elsa only wears the gold one at her coronation (no silver one at any point or in any promotional images). Our Elsa crown has officially become Ariel’s crown (I didn’t point out that Ariel doesn’t bother with a tiara either). Here’s the back, maybe you can see why I couldn’t resist the train! part is separate and was made using a pattern for a capped sleeve piece to another dress. The little collar was made by tracing the neckline and adding enough material to be able to fold it over and attach it to neck. The back part of the cloak was cut out slightly tapered and wider than the top piece to allow for the pleats like Elsa’s. 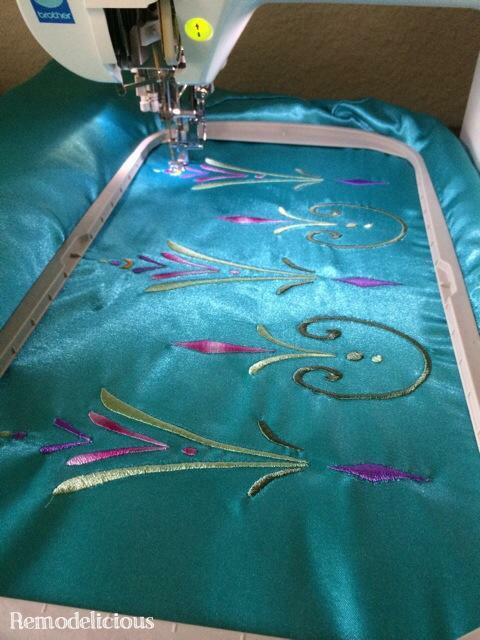 I attached the purple trim with a decorative flower stitch that resembled the designs in Frozen. I considered embroidering the end of the cloak to be movie-correct, but decided it was really too much in person. I found a cute blue jeweled button and was planning to do a button hole, but decided at last minute to use velcro instead. This was a great move because she loves to toss the cloak off like Elsa does when she sings “Let It Go”. Here’s my princess in her DIY Elsa Coronation Gown! The glove is from the Disney Store Elsa Accessories Kit, although Lovey Leaf Appliqué on Etsy has an embroidery design to embroider the gloves as well. She literally couldn’t help performing with the ensemble complete. 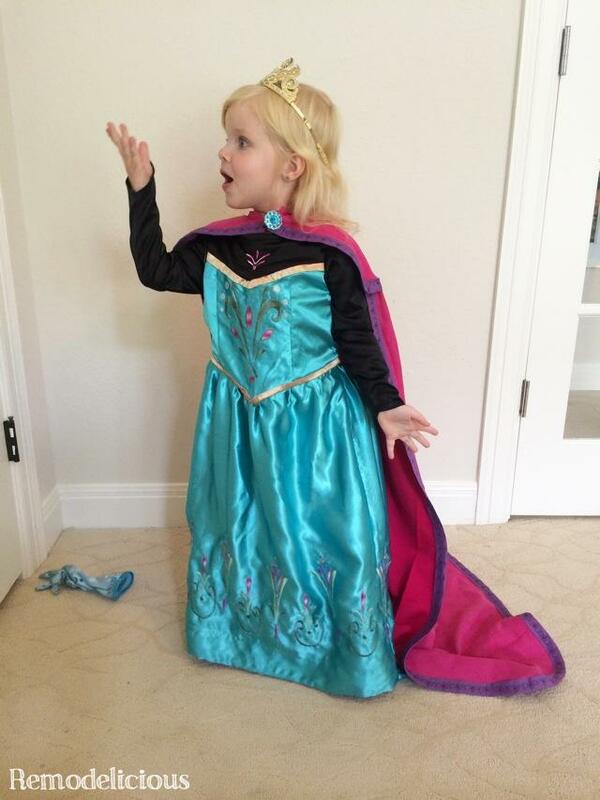 And, of course, Anna raided Elsa’s closet (just like in the deleted scenes). I love that she happened to have messy, low pigtails that day instead of one of her usual styles. We love Frozen, but are glad that summer is here! 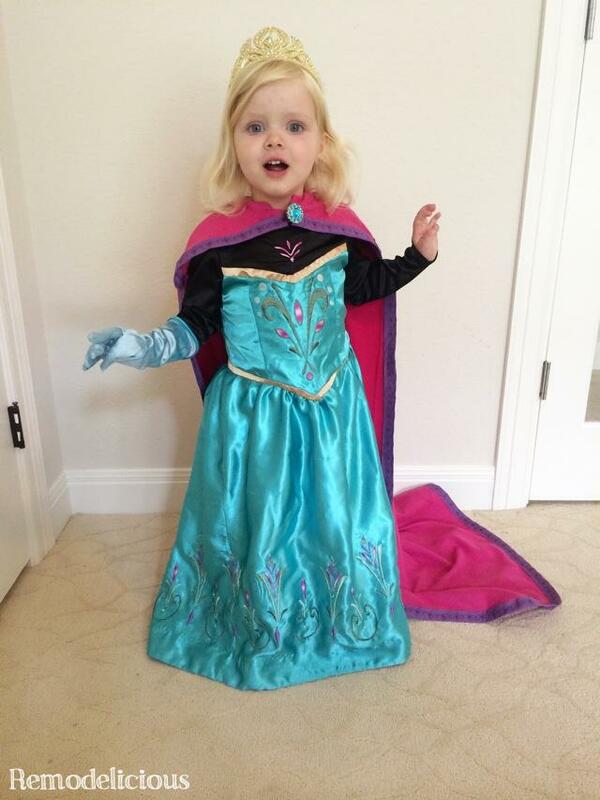 Seriously, I’m more obsessed with my daughters as the princesses of Arendale than I am with the movie Frozen. They are so beautiful that sometimes it’s like living with fairytale princesses in real life ;-). Wow, I actually just made a dress myself that knocks the socks off of anything at the Disney Store, plus it doesn’t have any scratchy parts or random glitter. And now that want the Anna coronation dress, made by me. Whew! Wow! 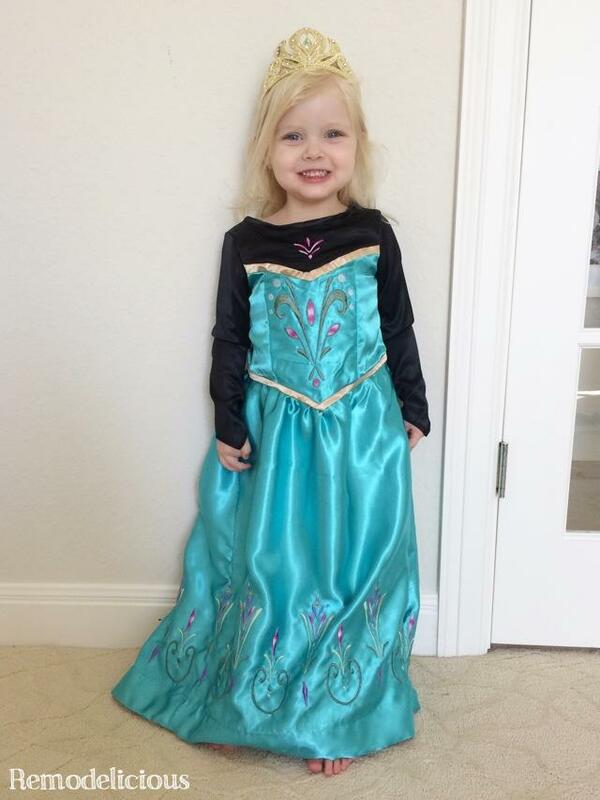 Your Elsa coronation dress is outstanding! Do you sell these ad if so, for how much? I am considering selling them, but the embroidery is labor-intensive so they would be at least $200, probably closer to $300. I’m working on figuring out the pricing, if you.re interested, feel free to contact me! Thank you! I learned my machine through a lot of trial and error, reading the manual, talking to others (it seems like everyone has different techniques), and through internet searches including YouTube videos. When you buy a new machine, most shops offer free classes to acquaint you with your new machine and paid classes afterward and for the general public. I haven’t taken these classes and purchased my machine second hand (so no free lessons), but they can be a great resource. In general, when there’s a particular project that I want to do but have never done before, I’ll ask friends or those who work at my local sewing shop (I’ll always buy stabilizers & thread there in exchange) and see how others have done similar projects online. 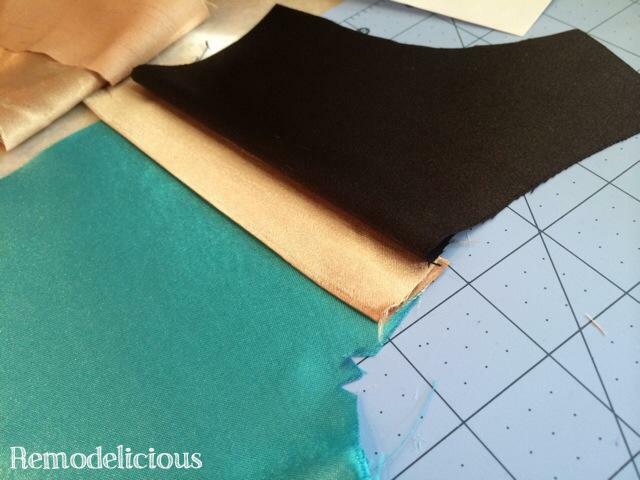 I mostly use fusible stabilizers, but know many prefer adhesive ones and have a project coming up where I plan to try it since it is perfect for that application. I also invested in a quality machine after learning the ropes on a basic one. Since I know how to do all of the settings manually, I know how to “help” my nicer machine that does many things automatically by setting up the hoops and designs accordingly. Recently I even serviced my machine after speaking with someone at the store who was able to tell me what the problem was, but that it would be weeks before they could get to it… then I found resources online that could help me complete the service myself. It’s all about asking questions and spending time finding a solution. Thanks for such a long reply! I already own a sewing machine, so no free classes for me. I have experimented with appliqué a lot using zigzag stitch. But I really want to be able to do the clean-cut neat embroidery like yours. Seriously, a lot of youtube tutorials show embroidery that is pretty sloppy (in my opinion, I am a perfectionist about things like that), and yours is just perfect. Any particular tutorials and channels you can recommend? Any recommendations on the hoops? Awesome that you were able to service the machine yourself! 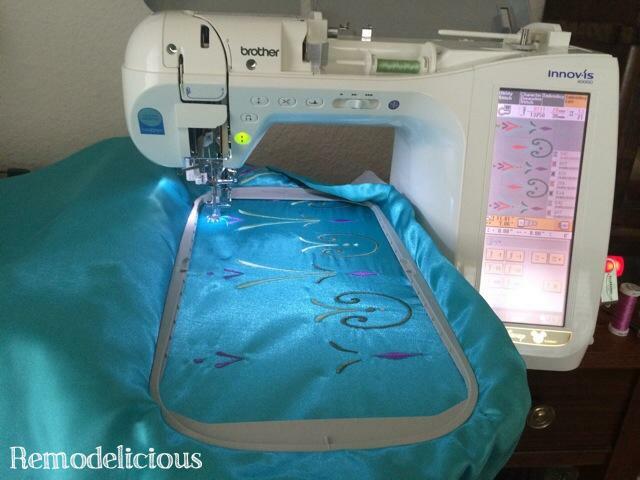 I have an embroidery machine so after I set it up, it does the hard work for me. Getting the right stabilizer and needle combo is really important. For this project, I used fusable stabilizer, polyester thread, and embroidery needles 90/14. I don’t follow any particular blogs or channels since I’m always doing different types of projects and most people tend to specialize… So it depends on the project.